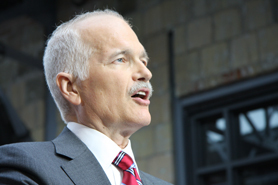 The Honourable Jack Layton, leader of the New Democratic Party (NDP) of Canada, died this week from cancer. He was 61. Layton guided the NDP to become Canada’s Official Opposition for the first time in its 50-year history in the May 2011 elections, all the while battling cancer. You can read the letter in its entirety by going to the NDP website. Layton is survived by his wife, Olivia Chow, a former Toronto city councilor, and now a New Democrat Parliament member in Toronto, and his two children, Sarah and Mike, from a previous marriage. Mike is now a Toronto city councilor.